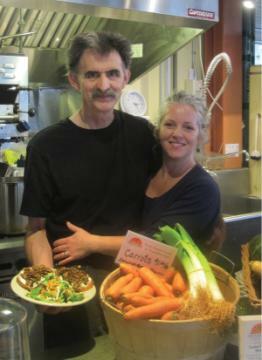 “My wife Minga and I have had a lifelong passion for good food that is grown locally and organically whenever possible. Food prepared in our kitchen offers the highest nutritional value, intensely delicious flavours and is truly hand-made comfort food prepared for you. What’s a girl to do by mid February when the craving for juicy things and green things is already starting to build and there is still a long Nova Scotia winter ahead of us? I’m trying to be good. I’m trying to be organic and local. Who would have thought you can have your root vegetables and your juicy things too!? Down at Selwood Green-Norbert’s Good Food we are dusting off the juicer and oh my! Juiciness! Juicy roots! Bunny’s Delight is a bright orange bit of sunshine in a glass, made with the best roots Nova Scotia has to offer. Norbert’s own sweet organic carrots. If you really love your roots, get fresh with the Ruby Lips: a blend of our own sweet organic carrots, and organic beets, Boates or Noggins apples and add some heat with a bit of ginger. Ruby Lips = juicy immune boosting love! Ps….I’ll let you in on a secret…I stashed a whole bunch of parsley that I harvested from our fields late this fall in the freezer. It is bright green and full of goodness. So, if you can’t live without your greens, we can add parsley to your smoothie. It’s even tastier than kale (which we’re out of, except for our occasional limited editions)…zestier and chock full of vitamin C! Local, organic blueberries and parsley in your smoothie! Wholesome, local, organic, yummy juiciness! Oh my! How do you get your juiciness on in the winter? We didn’t know when we first opened our shop in the Halifax Seaport Market that our All Day Breakfasts would be so popular. In the process of growing into our new Market business, we realized breakfast is important. Here at Selwood Green-Norbert’s Good Food, we love breakfast. In fact, as a family, we’ve always loved to go out or cook breakfast at any time of day. As farmers, breakfast food is often a welcome comfort food- any time of day. And many of the vendors we are friends with here at the Seaport Farmer’s Market are hungry for breakfast after a very early morning preparing their cars and trucks, driving to the market and unloading in preparation for a long day. At the farm, there were often days when Norbert himself only had an hour or so of sleep before heading to town to sell vegetables on Saturday morning. In order to boost his energy through the day, he needed a good breakfast. In our family we’ve been fortunate to have a ongoing supply of organic produce and eggs. Now we are offering that served up breakfast style to our customers, too. Our #1 best-seller continues to be the OMG Egg Croissant Sandwich. We see people coming back week after week saying how much they crave this affordable, yummy, organic and healthy breakfast dish. Our other big hit is the hardy Seaport Market Full Breakfast. Both of these are listed on the MENU page. Next time you are looking for a delicious, affordable, local, organic breakfast in Halifax, drop down to Selwood Green-Norbert’s Good Food in the north east corner of the Seaport Market. Where else in town can you get breakfast cooked by the farmer himself? Celeriac, still standing. Things are really winding down now for the season. It is October 21, 2012. It is that time of year when the pickin’s from the farm focus on nutritious roots. We have spinach growing very, very slowly in the unheated greenhouse…mostly it is just waiting…waiting for a sunny day, like the rest of us, to feel inspired to stretch out and grow a bit. There are a few little patches of holdouts of kale and collards in the fields (occasionally you stumble across a few handfuls that still look delicious-a few lucky customers were on the receiving end of such a find last Saturday! ), but mostly there are potatoes, carrots, beets, onions, parsnips and some cabbage in the cold storage. The roots. The last vestige of energy and nourishment in the plant kingdom. Our winter sustenance. Winter is a time to hunker down, curl up, turn in, retreat inside. We almost make like a plant and draw our energy deep inside us to store it and protect it and keep it alive so that in spring…! Well that’s another story! For now, we are rooted in the earth and appreciating it’s grounding balance to the airiness and boundlessness of summer. Savour your deep and quiet moods just as you savour the comfort and deep flavour of warm stews and soups and chicken gravies, all made with potatoes and carrots and beets and onions and parsnips! Roots to keep you rooted. Down at our market shop, Selwood Green-Norbert’s Good Food, we have root vegetables for sale for your soups and stews and roasting. Norbert has also been cooking up some super delicious Beef Stew w/ Rosemary on Wednesdays, using beef from Getaway Farm. This stew meat practically melts in your mouth and it seems to LOVE root vegetables too! He made a beautiful Sweet Potato with Roasted Root Vegetable Soup last week too. Stop by, he might be willing to share his recipes! Do you have a favourite root vegetable recipe that you think would knock our socks off this winter? Stop by or drop us a line! We’re pretty excited about our first Seaport Neighbourhood Shops Newsletter. You can find it in the Feb. 9 issue of The Coast, or at any of the participating vendors at the Seaport Market. It highlights many of the vendors, like us, who are set up and offering great food, 5/6/ even 7 days a week. Drop by and pick up a copy. Here’s our photo and article that appear with several other profiles. 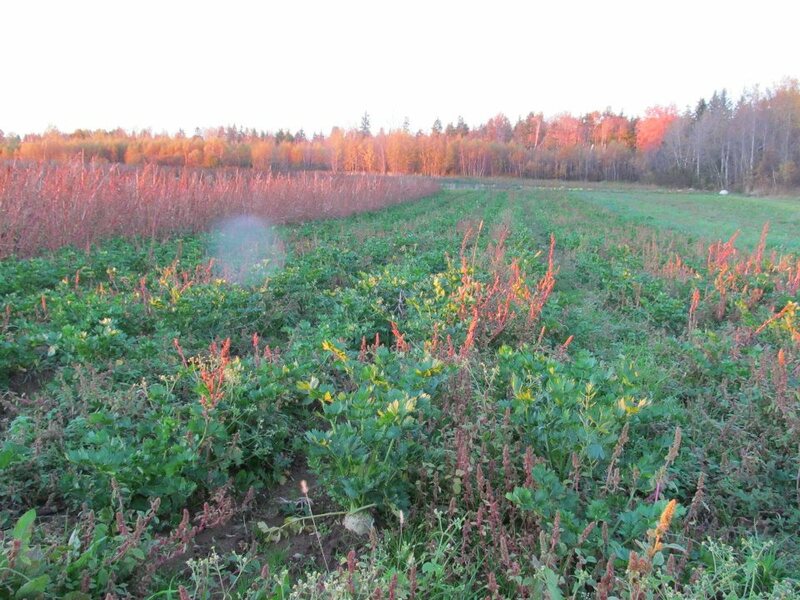 Since 1989 Norbert Kungl has been known as one of the leading advocates for local, organic farming in Nova Scotia through his family farm called Selwood Green, located in Hants County on the Minas Basin. When the new Seaport Farmers’ Market opened, Norbert and his wife Minga were ready for something new and so they opened Norbert’s Good Food, a special combination of his fresh, seasonal fruit and vegetable stand and a breakfast/lunch counter. This is the only place in Halifax where you are eating food prepared for you by the farm family that grew it. Norbert’s Good Food is also the Halifax outlet for the Boulangerie La Vendeene organic bakery. Enjoy comfort food that is lovingly prepared from family recipes and naturally localicious. On Wednesday, February 22, the topic is Urban Gardening Planning and Seed Ordering. Menu: Chicken Stew w/ Dumplings or Vegetarian Hungarian Mushroom Soup (both come with salad and bread). Coffee and tea included. On Tuesday, March 6, the topic is Seed Ordering and Seedling Production. Menu: Beef Stew w/ Dumplings or Vegetarian Roasted Root Vegetable Stew (both come with salad and bread). Coffe and tea included. Both workshops run from 4:00 pm to 6:30 pm and cost $22 per person and includes a hearty soup or stew for everyone who registers. Call 420 0376 or email us at novahort@yahoo.ca to reserve your spot. Payment must be received by the Sunday before the workshop in order to confirm your spot. All payments to be made at Selwood Green-Norbert’s Good Food Market Shop at the Halifax Seaport Farmer’s Market. WE reserve the right to cancel the workshop due to low enrollment. All Day Breakfast 7 days a week!